Bujumbura – Severe flooding in Burundi has affected thousands of people around the capital, Bujumbura. The death toll since February’s initial flooding is at least 77. Displaced communities have been among the most affected. “The heavy rain came with a strong wind. It came into the house and everything was destroyed”, said Ndayishimiye Ntampera, who lives in Gatumba, a town 15 kilometres from Bujumbura. “We were displaced for a month. We used sheeting to camp in the fields. When the army took the sheeting back, we were forced to return to our house”. Gatumba is home to thousands displaced by Burundi’s recent civil war. Refugees continue to arrive from across the nearby border with the Democratic Republic of Congo. The Jesuit Refugee Service (JRS) has responded to the emergency in Gatumba by distributing essential items. In mid-April, 700 households collected jerry cans, blankets, cooking pots, clothes and other household items. “Unfortunately, thousands of people here were victim to the floods. The parish has been fortunate to cooperate with JRS in providing those items of immediate necessity to the identified households”, said parish priest Fr Lambert. 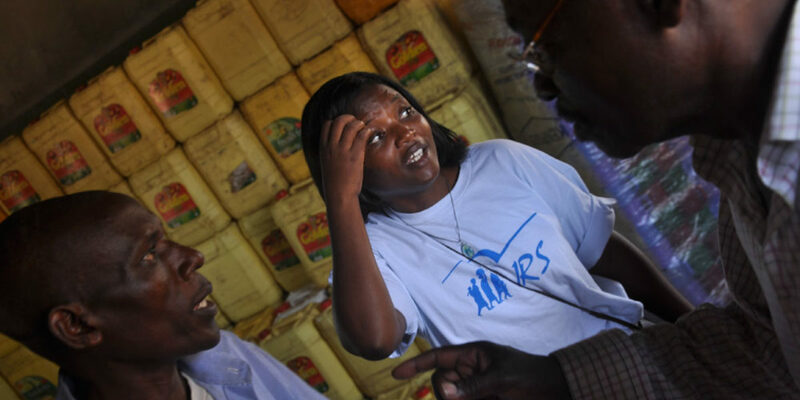 “We hope to continue to respond rapidly to this crisis”, said JRS Logistics Officer Marie-Grâce Mukanyiligira, who oversaw the distributions. “In cooperation with the Society of Jesus and the local church, we have undertaken a further needs assessment to identify houses most in need of repair”. JRS will continue to support the population by repairing 40 houses for those still living in vulnerable conditions. “Across Gatumba, people continue to take shelter in unusual places, especially as we are still in the rainy season. For instance, thirty-six people are living in a small church. Every Sunday, they have to move out, and then move back in again”, said Fr Lambert. The flooding continues to cover fields, further affecting the livelihoods of the population. “The majority of Gatumba is extremely poor because they have been displaced by war. Many of these families lost their livelihoods when the central market in Bujumbura burned down last year”, continued Fr Lambert. A recent study undertaken by local organisation Conseil pour l’Education et le Développement indicates that thousands of people were directly dependent upon the market, which is yet to be reopened. “Our house was almost totally destroyed by the floods. Clothes, plates, furniture: everything was lost”, said Madeleine Sinzabakwira, who moved to Gatumba during the war. Due to a lack of iron sheeting, many grass roofs caved in during the downpours. “It was really a catastrophe. When the roof fell in, we couldn’t understand how it happened”, said Didier Nisabwe. “I’m now living with my cousin, but I have to rebuild my house. My family has to live here; we have nowhere else to go. I retain hope for the future and trust in God. But it is not easy”.